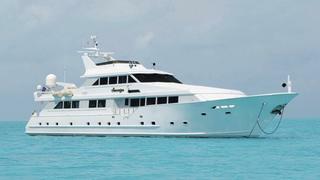 Simon Gibson at Worth Avenue Yachts sends word pf a $200,000 price drop on the 36.6m motor yacht Sovereign. Sovereign has always been regularly maintained during the six years of her current ownership and is now keenly for sale as the owner has purchased a larger yacht. Lying in Miami, Sovereign is down from $2,495,000 to $2,295,000.